FOR THOSE unfamiliar with the discipline of three-cushion, it doesn't take very long to see why the noble game offers an endless supply of material for this column space. In this month's Stroke of Genius, we look back at the 1992 Sang Lee Open, held at the 12-time U.S. champ's own room. Daniel S�nchez, then the reigning junior world champion, made his American debut in the Big Apple against the world's best. In his first match, the 18-year-old upset reigning world champ Torbjorn Blomdahl, only to then face Lee in his homeroom. S�nchez fell behind early, but caught fire in the 50-point game. Putting together strong runs of five and six to claim the lead, the youngster uncorked this little six-rail dandy. As commentator Robert Byrne said, a player would be foolish to even attempt this shot on anything but the most perfect of conditions, with the cleanest balls and ultra-fast cloth. Needing to send the cue ball on a circuitous journey off six rails, S�nchez loaded up on high English and drilled the left side of the yellow. With the cue ball slightly hopping from the powerful stroke delivered by S�nchez, the yellow crisscrossed the table. 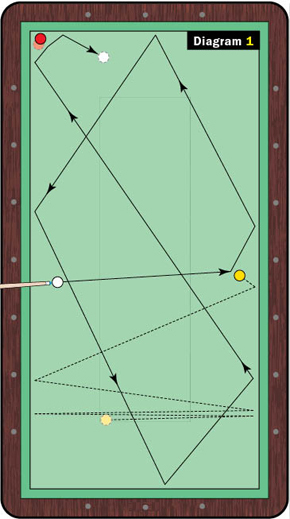 The cue ball easily avoided the kiss while navigating to the bottom half of the table, and then made a straight line for the top left corner and the red. It clipped the other edge of the red, before coming to rest just a few inches from the corner. S�nchez went on to win the match to the delight of Lee's hometown crowd unaccustomed to seeing the proprietor on the wrong side of a 50-point score line. The stunning debut on American soil was no aberration; six years later, S�nchez was the world champion, and he remains one of the world's finest three-cushion players.